CALL TO ACTION: Contract expires Sept. 5; stand with our team! As most of you are aware, our three-year agreement with the administration will expire next Tuesday, September 5, at midnight. Of course, Tuesday is also the first day of classes for the 2017-18 academic year. This means that we faculty have a lot happening on the 5th, not to mention a lot on our plates already as we prepare our classes and get ready to meet our students. But I am asking you today – all of you — to take on just a little more. Our WMU-AAUP bargaining team needs your support as they prepare for the last few bargaining sessions before the contract expires next week. They will need it especially as they head back to the table on the evening of Tuesday the 5th for the final scheduled session in advance of the midnight deadline. Our team has been negotiating with the administration’s team for more than five months and has already achieved a lot on our behalf. But as we all know, the last issues left to resolve are also among the most contentious: compensation and healthcare. And we are going to need to use our leverage — that means acting collectively to support our team — to help them get us the kind of outcome we want and deserve. 2. FALL BBQ (5-7 p.m., Montague House, 814 Oakland Drive). Come over to the BBQ straight from the chapter meeting or stop home to pick up your family on the way. If you aren’t teaching Tuesday evening, we need you at Montague House. We’ll have Big Moe’s BBQ, lots of vegetarian sides, yummy desserts, fun for the kiddos, and of course lots of refreshing adult beverages, which we’re probably going to need, especially if the negotiations continue late into the night as they have in past negotiation cycles. 3. RALLY (6:20 p.m., Montague House). If you’re already planning to be at the BBQ, this is an easy one. But whatever your plans, unless you’ll be in class, please make a point of showing up for the rally. We will assemble at Montague House and then accompany our team across the street for their 6:30 p.m. bargaining session, the last session before the 2014-17 contract expires at midnight. Despite the many demands and challenges of this lengthy and grueling negotiation cycle, Cynthia, Whitney, Bruce, Jeremy, and Michael have not let up, and they have assured the WMU-AAUP Executive Committee that they have no intention of slowing down now. The important and encouraging gains they’ve made at the table in recent weeks are evidence of that. But to finish strong, they are going to need us to turn out for them next Tuesday like never before. Thank you for all you’ve done to support our team up to now and in advance for doing everything you can to turn out for them on Tuesday. Your vocal, visible support – in the largest numbers possible – is what it’s going to take to get the contract we want and deserve. Together, we can make it happen. See you on September 5. P.S. As we wrote last week, we all want very much for this contract to be resolved by the deadline. However, we are going to need to be prepared for possible actions to take on September 6 in the event that the two teams do not reach a tentative agreement by midnight on on the 5th. We will be sending you more information about this tomorrow. Since the administration’s mass email arrived in our inboxes just after midnight on Saturday, August 19, we have been hearing from our colleagues about what they think of the administration’s proposals and what they are looking for in our next contract. We share here some of what they had to say. “That email from the admin actually makes me feel so much better about your efforts. I have even more energy and support for our union. “How much did the admin spend on the renovation to Heritage Hall? How much in the negative does our athletic department run? How much were we willing to pay PJ Fleck to stay another 10 years? I bet all these answers are 20 million plus or close to it. It is all about priorities. “The email from the admin makes them look misguided. They have lost their way. The WMU experience begins and ends and revolves around the faculty. We are the bridge to our students, alumni, employers, etc., and all other constituents. The admin is supposed to support and reward us and often they do neither. “I will be fine either way. I just feel terrible for the majority of my colleagues who really struggle to maintain a quality of life that should be had with our profession. We need a gesture of good faith from the admin to end this nonsense and set a new tone for a better relationship where we can move forward together. “I can only imagine what other faculty are going to have to do in order not to go under water financially if this current offer is accepted in any form. The Michigan economy is on an uptick. In spite of insane things happening in Washington, D.C., the overall economy is strong. There is no reason for this to be happening. I’m a staff member. I took a pay cut 18 years ago to come to WMU for the great benefits. I hope I don’t regret that decision. Demonstration at Seibert admin building Wed. 8/23 at 1 p.m.
After 29 bargaining sessions and with fewer than three weeks left before the contract between the WMU-AAUP and Western Michigan University expires, our team is still hard at work negotiating a fair contract that protects faculty rights and moves us forward economically. At this point in the negotiations, they have accomplished a great deal. They have successfully negotiated and reached tentative agreements on 10 contract articles with a handful of articles still open but close to resolution. The two teams have had lengthy discussions about health care insurance costs. In response to the administration’s team’s proposal to change the design of our health insurance plan, our team has worked with the administration to model the effects of these changes on premiums. We recognize that health care costs are uncertain and that they are likely to increase over the next three years. Based on feedback from our members, our position has always been that the cost of our premiums must be contained. Therefore, to control these costs, our team was willing to consider the administration’s proposals for plan design changes. On August 8, the administration’s team presented their proposal for Article 33: Health Care Benefits and Insurance. They propose raising premiums in 2019 and 2020 and increasing deductibles, copays, and out-of-pocket maximums, as well as adding 10 percent “coinsurance,” meaning that instead of receiving 100 percent coverage, we would be expected to pay 10 percent of the total cost of a service or office visit after deductible is met up to the annual out-of-pocket max. In addition, they propose decreasing faculty benefits at Sindecuse by reducing the pharmacy discount and eliminating the no-copay no-deductible services available at Sindecuse and at the Unified Clinics. Their proposal also includes cutting the number of covered chiropractic visits per year by half and implementing prescription drug preauthorization in some cases (“step therapy”). Given the extent of these proposed changes, our team has insisted that if we were to accept them, then the faculty must receive salary adjustments that more than offset these increased costs. However, the administration’s most recent proposal for Article 32: Economic Compensation, which they brought after we worked in good faith with the administration to significantly narrow the gap on health insurance costs, would increase across-the-board raises by only 0.25% more than their previous proposal. Moreover, their proposal included zero adjustments to salary minima, overload rates, and promotion increments. Stand with our team and demand a fair contract! WMU-AAUP demonstration at Seibert on Wednesday, Aug. 23, at 1 p.m.
As you read these words, we are less than three weeks away from the expiration of our contract on Tuesday, September 5, at midnight. The negotiations will almost certainly continue right up to the 5th. In the coming weeks, the team still has a lot of work to do to win a healthcare package and salary increases that will move the faculty unequivocally forward. They have been at it for months and have made a powerful and well-informed case based on research, data, and logic. But because contract negotiations are inherently asymmetric, making the stronger case is not always enough. The university administration is management, and as management, they control the resources. However, they don’t control the 900 of us, and that is where we come in. Our leverage is in our numbers, and the time has come for us to deliver on our team’s behalf and make sure our voices are heard loudly and clearly. What our team needs now, and what we all need now, is for YOU to do everything YOU can to show your support, loudly and publicly. We need YOU to engage in the important work that has to happen away from the table to ensure our team’s success at the table. The way we keep up the pressure on the other side is with our visible, vocal support. The time is NOW. All board-appointed faculty colleagues are strongly urged to attend, as are family members, retirees, and colleagues from other WMU employee groups who want to stand in solidarity because they understand that we are all in this together. We also welcome students, alumni, community members, and other allies who value the work we do on behalf of Western Michigan University and on behalf of this community. 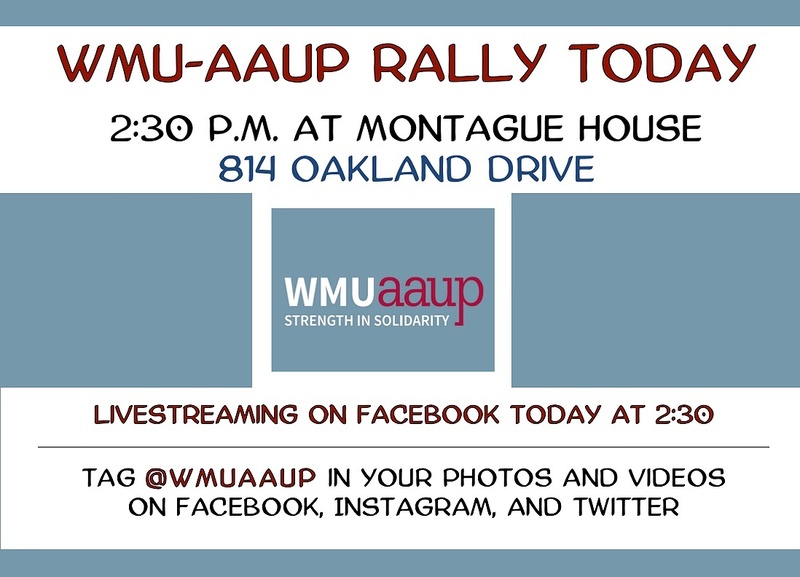 Rally for our team any time on Facebook, Twitter, and Instagram @wmuaaup. They appreciate your messages of support! Monday, April 24, at 2:30 p.m. The semester is winding down, but contract negotiations are heating up! Take a break from your grading, bring your signs, and let’s show our WMU-AAUP bargaining team that we have their backs! Before the faculty disperses for the summer, we need a strong show of support for our team as they prepare to bargain economic articles in May. A large turnout will send a strong message to the team that the faculty is behind them and alerts the administration that we are ready to take action as needed. All bargaining-unit faculty should plan to attend this important event. We also welcome retired faculty as well as students, staff, alumni, family, friends, and other allies. Easy parking at Walwood Hall and WMU Lot 10 or 11 (the Little Theater). Please don’t park at the medical school. Their management is not nice about it. Get all the latest news about contract negotiations by subscribing to the blog (click on the “subscribe” button on the home page) and following the WMU-AAUP on Facebook, Twitter, and Instagram.